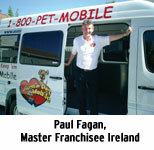 Fagan is well qualified to develop Aussie Pet Mobile throughout the UK and Ireland having grown Action International in Ireland as Master Franchisee and winning the 2005 'Service Franchise of the Year', awarded by the Irish Franchise Association. According to Fagan, the franchise is hugely successful in the US, Japan and Australia because the client target market are people with pets who are time poor, but happy to pay for someone to visit their home and pamper the pooch. Founded in 1996 in Sydney Australia by Ian Moses, Aussie Pet Mobile is the world's fastest growing pet grooming franchise with more than 300 franchisees in four countries. 'This is a great opportunity for people from financial, marketing or corporate management backgrounds,' says Fagan. Aussie Pet Mobile is a scaleable business with no need for retail premises. Once one van is fully booked with appointments, you simply add another. Fagan would like to hear from highly motivated and successful business owners who can see the huge potential of this business and want to build a sustainable cash flow.